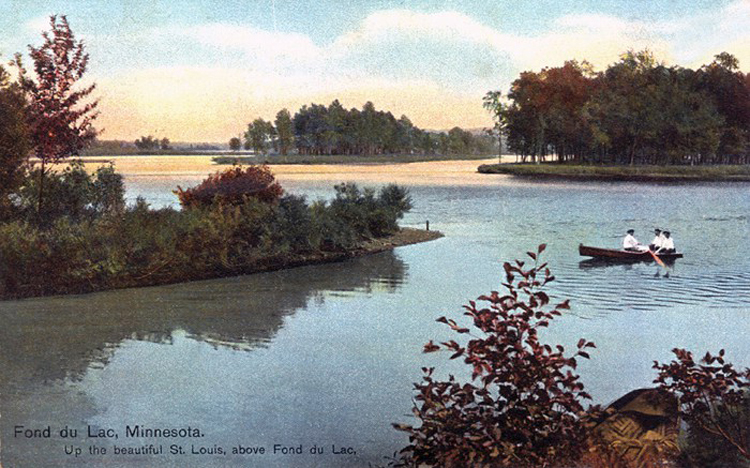 Today the name Fond du Lac Park is associated with a small recreation area adjacent to Mission Creek on the north side of Highway 23 in Duluth’s Fond du Lac neighborhood. But in 1923 Mayor Sam Snively gave this name to one of Duluth’s largest greenspaces after the city purchased over five hundred acres of Emily Chambers’s land along Mission Creek. In 2012 Snively’s Fond du Lac Park became part of the larger F. Rodney Paine Forest Preserve. 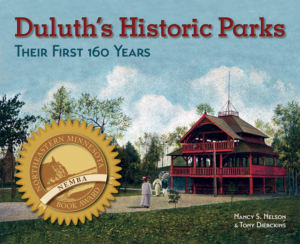 Accessible only by a few trails today, in the late 1920s this huge forest park became a key link in Duluth’s parkway system and served as a winter playground for Duluthians during the Depression and World War II. In addition, for over three decades, the area was home to an arboretum and a municipal nursery that provided trees for the city’s boulevards and flowers for the entire park system. But, just like nearby Chambers Grove and Historical Parks, the story of the land that makes up Fond du Lac Park reaches even deeper into the past. Mission Creek flows through the heart of Fond du Lac. The creek’s name came from the first Christian mission in the area, which was located along its eastern bank. Europeans arrived in the Fond du Lac area in 1817 when the American Fur Company built a trading post along the St. Louis River at what is now 133rd Avenue West. In 1833 the American Board of Missions sent twenty-four-year old Reverend Edmund F. Ely to Fond du Lac to convert the native Ojibwe people to Christianity. Ely built his mission directly north and east of the trading post—above State Highway 23 between Mission Creek and 131st Avenue West on today’s maps. There he set to work creating an Ojibwe language dictionary and taught English grammar and arithmetic to the native and mixed-race children who lived nearby. The missionary witnessed two significant firsts at the Head of the Lakes. September 10, 1834, saw the first Protestant wedding in the region, the union of Ely’s colleague Reverend William T. Boutwell and Hester Crooks. Crooks was the daughter of Ramsay Crooks, who had taken control of the American Fur Company when Astor’s charter expired in 1833. Two years later, on May 29, 1836, Ely’s wife Catharine gave birth to Mary Wright Ely, thought to be the first child of entirely European descent born in what is now Duluth. The board of missions transferred Ely to Lake Pokegama in 1839. A number of ministers followed him at the Fond du Lac mission, but they all faced the same frustrations: the fur post had its own lay priest, clerk Pierre Cotte, and most of the native population either had no interest in Christianity or had already been converted to Catholicism by the French. The mission closed in 1849, but it is remembered today because the creek still bears its name. Six years after the mission closed, a handful of pioneers established Fond du Lac Township. They included Reuben Carlton (namesake of Carlton County), Alexander Paul, George Morrison, Joshua B. Culver (Duluth’s first mayor), and Francis Roussain, who had lived in the area since the days of the fur trade. When they platted the township’s streets in 1856, they set aside one block of public greenspace known as Fond du Lac Square, located not far from the site of the old mission, between today’s West Third Street (State Highway 23) and West Fourth Street from 130th to 131st Avenues West. The small park remained undeveloped, and when Jay Cooke’s Lake Superior & Mississippi Railroad was built along the St. Louis River in 1870, the tracks were laid right through Fond du Lac Square. Then, in the 1930s, the state of Minnesota took additional land from the square for Highway 23. Because little was left of the greenspace, the City of Duluth dedicated a two-block rectangle of land west of the square (between 131st to 132nd Avenues West from West Third Street north to West Fifth Street) for a small recreation area where, according to park department records, tennis courts were built in 1929 with funds donated by the Fond du Lac group of the Garden Flower Society. An athletic field and basketball court were added later, and the area was christened Fond du Lac Park. The railroad tracks also cut through a graveyard that had been established north of the fur post. The cemetery is thought to have had two distinct sections: one for the bodies of European Christians and Ojibwe who had converted to Christianity, the other for Ojibwe who practiced the traditional Medewiwin faith (some accounts claim there were three sections: one for Europeans, one for Ojibwe Christians, and the third for Medewiwin Ojibwe). The cemetery contained the remains of Francis Roussain’s family and other relatives of Fond du Lac settlers as well as members of the Ojibwe community who still called the area home. The Roussain cemetery is located on the far western edge of the F. Rodney Paine Forest Preserve adjacent to Jay Cooke State Park; it was maintained through the 1950s by the Duluth Park Department. It has since become the property of the Fond du Lac Band of Lake Superior Chippewa, which has allowed the cemetery to grow over so it is less tempting to vandals. Encouraged by the affordability of automobiles, by the 1920s middle-class families with recently acquired cars enthusiastically embraced the new pastime of auto tourism, in turn creating demand for more and better roads that would connect them to all parts of the country. The Minnesota highway department had decided that Trunk Highway 1 would be the first road to span the state from south to north—from the Iowa state line through the Twin Cities to Duluth and along the North Shore to the Canadian border.